When it comes to breakfast, a major part of switching to AIP (Autoimmune Paleo) means moving away from sweet. Now, that in no way means breakfast can’t be nourishing, interesting, or creative! But for me, (and maybe for many of you) breakfast has proven the most challenging “shift” when changing diet to AIP. And if we grew up eating the standard American breakfast, we mostly ate breakfasts like sugary cereal with cold milk. Or oatmeal sweetened with maple syrup or brown sugar. Or pancakes, eggs and toast. All of which are out now. Sweet Potato: Sweet potatoes contain high levels of vitamin A and are also a good source of vitamin C, the B vitamins, and fiber. Fiber helps us feel satiated, and slows the body’s absorption of sugars, which in turn keeps blood glucose levels steady (i.e. no sugar spikes). Fiber also helps us focus: a 2015 study on children ages 7-9 found that fiber contributed positively to “accuracy on an attentional inhibition task”. Now that is sweet! Rosemary: Want better memory? Smelling rosemary has been shown to help! And while you’ll be baking, not smelling, you’ll still be getting nutritional value: rosemary contains Vitamin A, C, the minerals manganese and copper, fiber…the list goes on. And don’t you just love the flavor combination of sausage that’s been made with rosemary, garlic, sea salt and a hint of maple syrup?! Cassava Flour: I just heart cassava flour. Even though I only use a small amount in this recipe, it’s one of my favorite alternatives to grain (and nut like almond) flour. It holds together well and bakes up beautiful bars, muffins, pancakes…you name it. Gelatin: A form of collagen made from the bones and organs of grass-fed beef, gelatin has numerous health benefits. It can help improve skin and strengthen nails and hair. One of its amino acids, lysine, has been linked to increased bone strength. One of my favorite benefits is that it helps our guts: another one of its amino acids, glycine, can promote a healthy stomach lining, which anyone with “leaky gut” needs! With these bars, you can have breakfast ready to go! They work great for any meal, of course, and are always good if you are on the go. Psst: This recipe is featured on Phoenix Helix’s Recipe Roundtable #195! 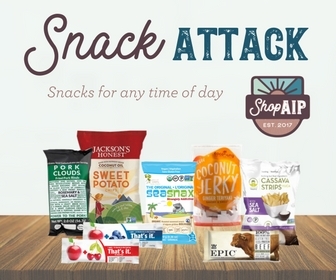 Check us out, along with all the many delicious AIP / Paleo recipes! Make pork sausage. In small bowl, mix together ground pork with maple syrup, sea sat, garlic and rosemary. If you have the time, let the mixture marinate for an hour (I didn't and still thought my sausage tasted wonderful). Cook in pan on stove top till cooked through. While cooking, prepare sweet potato. Take your peeled, cubed sweet potato and cook it in boiling water until easily pierced by a fork, about 5-7 minutes. Drain. In a medium bowl, mash sweet potato with a fork. Add the flours, baking soda, sea salt, rosemary and maple syrup and mix until well combined. Add the cooked sausage and combine. Make gelatin egg: using same pot you cooked sweet potato in, add the 1/3 cup water and sprinkle the gelatin over. Allow to "bloom" which takes about 2 mins. Turn heat to low and allow gelatin to dissolve (~2-3 mins). Whisk briskly till all foamy. Immediately add to bowl and mix till just combined. Pour contents into an 8 x 8 pan. (You can use slightly smaller but I wouldn't use larger - they will be too thin!) Press into place with clean fingers or back of large spoon. Bake for ~35 mins, until lightly browned around edges and a knife inserted comes out clean. Allow to cool 15-20 mins to continue firming up completely. Keep for 2-3 days in fridge. May also be frozen (but be sure to wrap very well!) for longer storage. Tastes best at room temp. Prep time will diminish considerably if you have sausage already made!